Trés chic sightseeing, singing and fashion! Alice-Miranda and her friends are in Paris with a group of teachers from Winchesterfield-Downsfordvale and the Fayle School for Boys. The students have a very exciting opportunity: to sing at Paris Fashion Week. The amazing city is humming with excitement and outrageous fashion choices – quite often coming from Mr Lipp, the children's choir conductor. But a couple of France's best known designers are harbouring serious secrets, and when Christian Fontaine has some expensive fabric stolen just days before his show, Alice-Miranda and her friends realise there is a darker side to the glitz and glamour of the famous city. 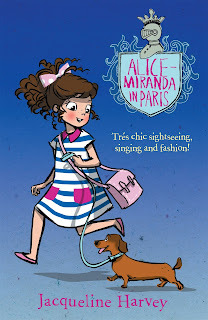 Alice-Miranda in Paris was an awesome book that had a great plot and a humorous and mysterious ensemble of characters. It made me feel like I was touring Paris myself and I could almost taste the croissants. The exploration of Paris was so well described and very informative, it sounded like a truly beautiful place. Alice-Miranda really has been everywhere. The plot in this novel kept my hands gripped to the pages and I couldn't put it down. Alice-Miranda in Paris was also very funny and as always, it had it's fair share of cuteness. But don't think that because it has awesome cover illustrations and a lot of cute factor that it is a baby's book. Because I think it's is really enjoyable and it is actually a 325 paged chapter book that a lot of ages enjoy, including 13 year olds. It's definitely refreshing because while it includes mayhem and mystery it is a fun read that has a lot of laughs and characters that you can relate to. As soon as I entered the launch there was a very friendly environment spread through the decorated room in the cinema beside Sheares. The day began with book purchases and signings as we all got our books signed and said hello to author, Jacqueline Harvey. Shortly the line was paused for an "Alice-Miranda Quiz" in which the last girl standing won. It was fun competing for prizes based on our knowledge and love of the series with other girls who had been on those adventures too. I got fairly far until I incorrectly answered Mille's last name. The quiz finally ended resulting in a 3 way prize. After that, a delicious array of french food was served and there was more then plenty to go around and let me say it was delicious. From macaroons to profiteroles and everything was really yummy. Next there was a fashion show that was split into three categories, Alice-Miranda look a likes, Other characters from the series and french fashionistas/other (I fit into that one). Afterwards there was a chance to win movie tickets by creating a berate for AM to wear. Unfortunately by that time people had gotten craft crazy and there were no good supplies left, so I didn't enter that one. The event was really fun and I even made a friend there who I have since made contact with and helped make a blog. She would like her identity to be kept as G and she is new to the blogosphere, I would highly recommend you stop by her awesome book blog, Reading Around the Lines. This is a great post, Sunny! I'm not familiar with Jacqueline Harvey's books, but I love a humorous book with a bit of mystery weaved in, so I think I would really enjoy this one. It looks like you had a wonderful time at the event! The quiz sounds really fun, and it's awesome that you made a new friend! Ooh, you are so lucky! I've never been to a book launch before, but I once went to an author event and it was amazing. The atmosphere is so friendly.